Born in York to Edward and Edith Fawkes, Guy Fawkes was baptised a Protestant at St Michael le Belfry on the 16th April 1570. His father was a proctor of the ecclesiastical courts and advocate of the consistory court of the Archbishop of York, who died when the boy was eight. Guy’s mother later married a Catholic, Dionis Baynbrigge and Guy Fawkes converted to Roman Catholic. 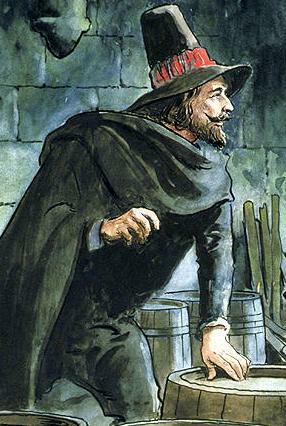 Guy Fawkes went to Europe to fight for the Spanish Catholics in the Eighty Years War. While fighting in Flanders, he was asked by Thomas Wintour to join a plot by Robert Catesby to kill the Protestant King James and as many Members of Parliament as possible.